“Thanks for providing us this Temple of Learning and Worship. The first concept of a temple for the practice of Liberal Judaism in Monticello was formulated by a small group of interested families in October of 1953. A public meeting for the crystalizing of this dream and aspiration was held January 19, 1954 at the Jewish Community Center. The community response was so enthusiastic that committees were immediately formed to organize the congregation. The first formal services of Temple Sholom were held at the Crawford Memorial Library on February 12, 1954. Within a short time the rapid growth of the congregation required larger quarters, and space was rented at the Jewish Community Center. Affiliation with the Union of American Hebrew Congregations and our charter in June 1954 set and fixed our course with the tenets of Reform Judaism. Four years later the sale of the Jewish Community Center forced Temple Sholom to find a new home and led to long years of wandering among rented spaces. The years from 1958 through 1962 tested our determination and gave us the resolve to plan for a permanent home. 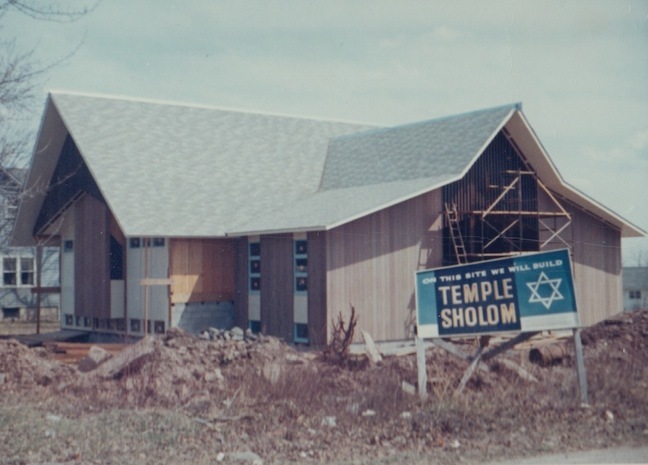 And so it was, just ten years after its very beginning, that we proudly dedicated our beautiful Temple Sholom. “May our children, and our children’s children, who will follow them, look back and say, “Thanks for providing us this Temple of Learning and Worship. Our lives have been fuller and richer as a result.” Then will all our efforts, our sacrifices, our trials and tribulations not been in vain. Source: Archives and Temple Sholom’s Dedication Journal, September 13, 1963. Photo shows the temple under construction, May 1963.